​The Northern Ireland Human Rights Commission is taking part in this year’s Culture Night Belfast, set to take place on Friday 22nd September. 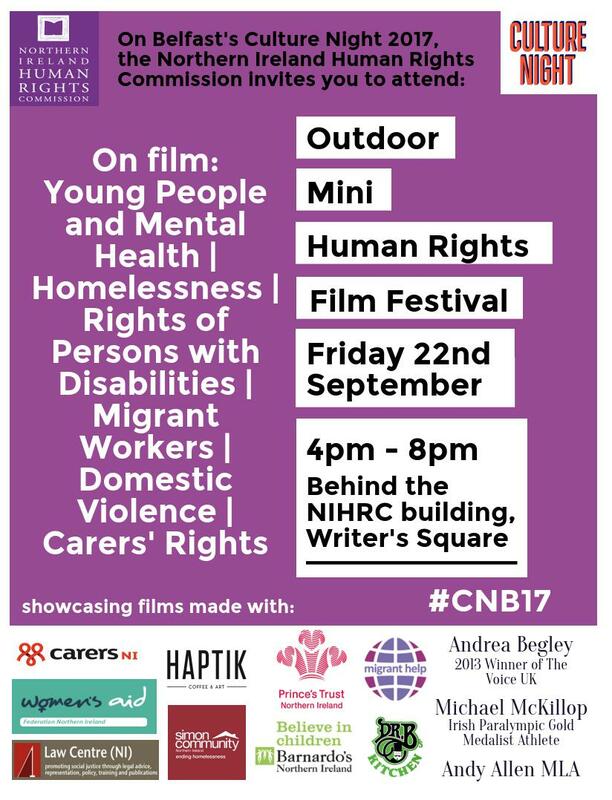 The Commission will host an Outdoor Mini Human Rights Film Festival in Writer’s Square as part of the annual celebrations, which usually attracts around 80,000 people to Belfast. The Film Festival will feature films made by the Commission in partnership with a variety of organisations and individuals - including Simon Community NI, Barnardo’s, Women’s Aid, the Law Centre NI, Migrant Help and Carers NI. Also featured are Haptik Coffee & Art; 2013 Winner of the Voice UK, Andrea Begley; Irish Paralympic Gold Medalist Athlete, Michael McKillop; and Andy Allen MLA, in the films which address issues such as homelessness, the rights of persons with disabilities, and carers’ rights. The Mini Film Festival will kick off with a preview of a film made with young people from the Prince’s Trust earlier in 2017, examining young people’s experiences of mental health. The Festival will run from 4pm to 8pm just behind the Commission building in Writer’s Square.